Leica M cameras are all about simplicity, precision and only the most careful development of its classic camera design. Its M-series cameras now have digital sensors, but the design of the body and even the focusing system is the same as its legendary M-series analog cameras. Leica M cameras use a manual ‘rangefinder’ system, where you turn the focus lever on the lens to line up two images in the viewfinder – when they overlap exactly, your subject is in focus. Leica users swear by this system, and experts can focus by feel even before they’ve put the camera to their eye, where the brightline viewfinder shows them what’s happening outside the frame, not just inside it. But these are cameras you have to learn to use, and Leica makes no concessions to beginners, and with the M10-P it’s made its new camera even more stripped down and ‘pure’ to the Leica concept. 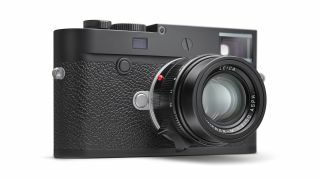 It’s based on the Leica M10 released in January 2017 and shares the same essential specifications, including the M10’s 24MP full-frame sensor. The changes in the M10-P are mechanical and operational rather than representing any giant leap in technology. It’s designed to focus on those core Leica M-camera features, notably understatement and discretion. Leica claims the new camera’s shutter sound is so quiet it’s "almost inaudible", and it’s the first digital model to be quieter than its film-based ancestor. Its exterior design is intended to be as discreet as its shutter sound, with no Leica red-dot logo on the front, just ‘Leica’ lettering on the top. There is a hotshoe, but its made to merge seamlessly with the top plate. There have been some operational tweaks, too. A new touch function allows faster focus checking in live view and review modes and there’s an integrated spirit level to help you keep the camera straight. All these will sound like changes too tiny to bother with for most camera users, but in the world of Leica, any new camera is exciting, even if it’s a lot like the old one. The Leica M10-P is available in black chrome or silver chrome finishes for £6,500 in the UK, with US and Australian prices to be confirmed.